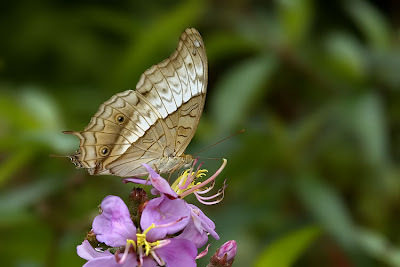 The month of March usually heralds the beginning of the butterfly season in SouthEast Asia, which peaks in April & May. 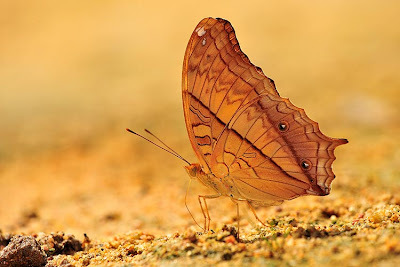 These are the few months of the year when the weather is generally hot and humid, and when butterflies are abundant in Malaysia, and to a lesser extent, in Singapore as well. 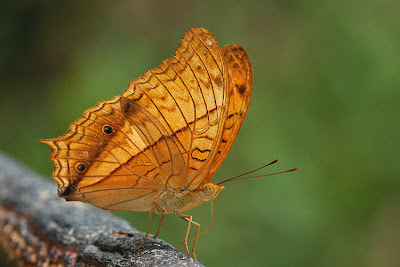 We feature a relatively common butterfly in Singapore - the Cruiser (Vindula dejone erotella). The species is very much a forest-dependent species, and is rarely, if ever, found in urban parks and gardens. 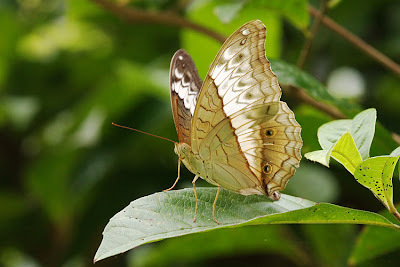 A regular in the forested nature reserves of Singapore, the Cruiser is a relatively large Nymphalid belonging to the subfamily Heliconiinae. This species displays a classic example of sexual dimorphism, where the male and female of the species are distinctly different in appearance. 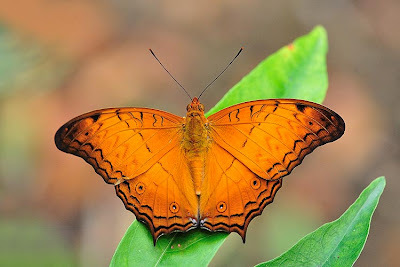 The male Cruiser is a rich fulvous orange above, and has a broad post-discal band of slightly paler colour on both wings. The band is broad at the forewing, and narrows almost to a point near the tornus of the hindwing. There are distinct black marginal and submarginal lines which give the wing a zig-zag appearance. There is a small orange apical spot on the forewing, and six black-centred ocelli on the hindwing, usually small in size. There is a short pointed tail at vein 4 of the hindwing. The undersides are lighter orange in colour. The female is usually larger in size, but is coloured a pale greenish grey. The post-discal band is white. The hindwings have three pairs of orange-yellow black-centred ocelli which are large and distinct. There is a small white apical spot on the forewing. The tail at vein 4 of the hindwing is longer than that of the male. The larval host plant is reported to be a species of Adenia (Passifloraceae) which is a vine with spring-like tendrils. In the nature reserves, males are often found puddling on fermenting organic matter, carrion and at urine-tainted banks of streams. They may also be observed puddling at muddy footpaths. They are less skittish when puddling and can be observed of one approaches them slowly. Males are also fond of sunbathing with their wings opened flat but they are skittish when not feeding. Females rarely puddle but can be found flying at great speeds high in amongst the treetop level. They are often seen perched on leaves at high level, with wings either opened flat or closed upright. Like the males, they are skittish, and take off quickly if they sense movement towards them. However, when they are encountered feeding on flowering plants, they are likely to be more cooperative for a closer observation. At public parks on the fringes of the nature reserves, both males and females have been observed together, feeding greedily on the flowers of Ixora and Lantana bushes. 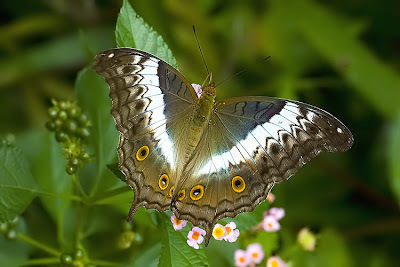 When feeding on flowers, they have a habit of opening and closing their wings regularly, and turning around. A female Cruiser feeding on the flowers of Ixora sp. 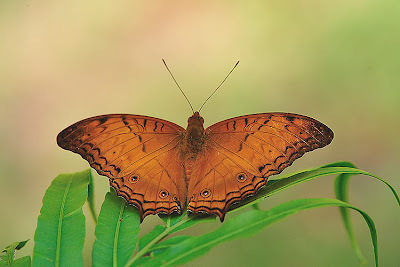 The Cruiser is a sun-loving butterfly and is active on bright hot days, and is probably one of the first few butterflies that a beginner butterfly watcher is likely to encounter in Singapore's forested nature areas. 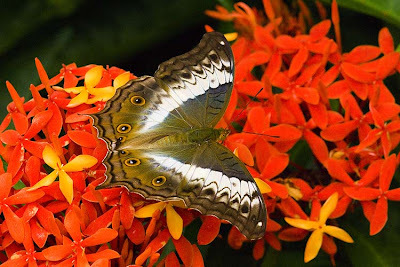 This blog article is dedicated to Tan Ben Jin, a veteran butterfly watcher and photographer, and a long-time friend and active supporter of ButterflyCircle.